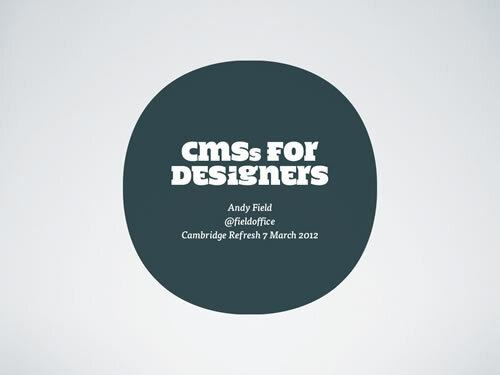 A short deck by Andy Field that caught my attention with the way he chose to include his screen shots. It ends up being a pitch for a certain CMS (though I don’t think he’s affiliated) but the humor in slide 8 should not go unnoticed. Simple, to the point, and not wordy; plus the circles that aren’t circles are visually interesting as well. i like the type, the not circle circles and yes, the cool format for screenshots. creative, simple & to the point.